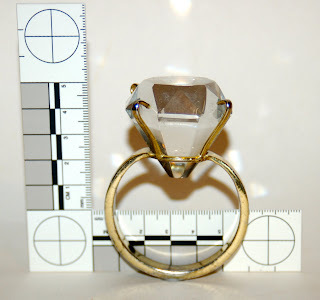 Yank Azman's Genuine Vintage: Biggest Diamond Ring Ever! Found this today at the Sunday Antique Market...and it's a gem. For the CSI challenged, it's 3" top to bottom. It's probably from a store display but I just couldn't resist my pre April Fools Day joke-ette. True Agent 99 ring - remember hers would always cut her out of a phone booth filling up with water?